It consists of a variable speed motor block with a regular hopper and a 5 litre / 5 1/4 qt. food processor bowl complete with a hub with serrated blades. 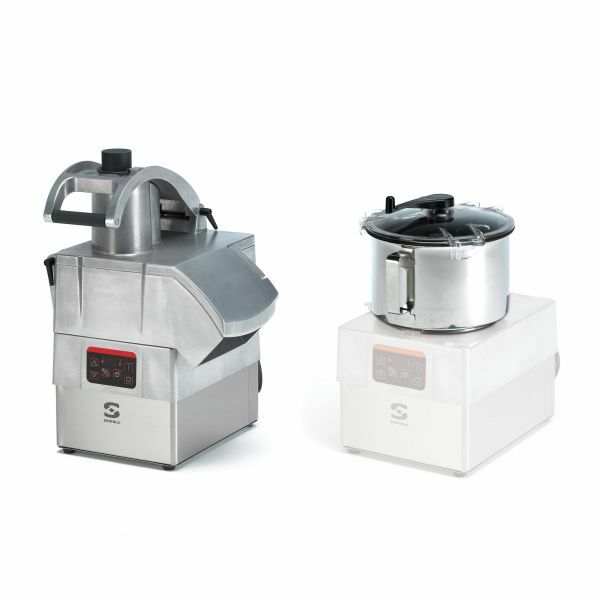 As vegetable preparation machine, its ergonomic design allows to cut the product in just one movement. As cutter, it is equipped with a 5-litre / 5 1/4 qt. bowl with a scraper and hub with serrated blades. Argonomic design: large production with only one arm motion. Lateral shootout: allows operation in reduced spaces and directs the product avoiding spray. External dimensions (WxDxH): 15.4 " x 16.3 " x 22.3 "
Bowl capacity: 5 1/8 qt. External dimensions (WxDxH):11.1 " x 15.4 " x 18.4 "
Net weight (Cutter): 51 lbs.